The confluence of these two stories struck me as interesting. An Article about rampant consumerism being harmful and a home being planned that is going to cost $155 million. If there is anything that embodies rampant consumerism it has to be this house. Why would you need a house that is worth that kind of money? Does it somehow make you happier to have such an extravagant dwelling or is it just a way to stick it at the lowly peasants who can't afford such? What kind of score do you get for owning such an extravagant home or do you get any points? Does such a pricey house drive up home prices in Montana for us peasants? Is such conspicuous consumption in keeping with a Montana lifestyle or is the Yellowstone Club, a gated community where the house is to be built, a country of its own and has no relation to Montana and it's lifestyle? I can't for the life of me figure out what one person would need with a house that costs such a large amount of money. I can't see how it would make you happy and healthy. The article on rampant consumerism really brings it into focus if you think about it. Bigger houses, more cars, larger televisions, younger faces - these goals are frenetically pursued by middle-class workaholics afflicted by "affluenza". "Studies in lots of different nations show that if you place high value on those things, you are more likely to suffer depression, anxiety, addictions and personality disorders," he said. Don't get me wrong here, a $155 million dollar home is not being marketed to the middle class, but the drives that lead to it are the same. I've thought about how I can expand my ranch or change my production for more profits on my ranch more than once. Get bigger, go to grass fed beef and market it myself, do a dude ranch concept, or other things. The drive, to bring more money and profit into the business. What stops me? Every time I think about something different like that I can't help thinking how these things would take away from the more important things in my life. My family. The drive for money is all fine and dandy, but family and personal relationships are just as important, if not more important, and need fostered to. You can try to buy love but it doesn't work out real well. To invest in personal relationships takes time, not money, so any pursuit for money costs you investment in time to your family. That's a sad fact. Speaking of peasants, this just goes to show you how Montana is being sold off to the rich and famous and those of us natives that are left are expected to be peasants to them. It is a trend that has been going on for a while and is only getting worse. A better business economy in the state would help this trend some, not enough so that the common worker could buy a $155 million dollar home, by helping to provide higher wage jobs in the state so the residents wouldn't be seen as peasants. I'm not sure our Legislature wants this though. By continuing to call businesses the problem in the state the selling off of our state continues. Can anyone tell me why the state of Montana is so unfriendly to businesses? They do provide jobs and services throughout the state so why no matter which way we turn does the Legislature take such aims to hurt them? Here, as reported by the Montana Main Street Blog, we have a bill with the grandiose title "Healthy Workplace" bill which will allow employees to sue employers for a "hostile work environment" and allows up yo $25,000 for emotional distress. It would make the employers responsible for the acts of other employees in the work environment. Real business friendly, isn't it. Does it really need to be any easier for an employee to sue an employer in this state? No, it can all ready be done. Then Montana Main Street Blog has three more examples of attacks on business by the state Legislature. I was upset enough at this point then I read in the Gazette the newest assault. Frustrated with what they perceive as a lack of effort by the federal government, some state lawmakers are proposing tough new state laws this session to target illegal immigrants and businesses that hire them. Leading the fight is Sen. Jim Shockley, R-Victor, who has four bills this session dealing with illegal immigration. He acknowledged crafting bills to fight unlawful immigration at a state level is difficult. But he believes it's necessary, arguing that the federal government, constitutionally tasked with all immigration matters, has no real interest in enforcing existing laws. Yes, here it is, let's make Montana business owners responsible for the national immigration problem in the US. That makes a lot of sense now doesn't it. How are we Montana business supposed to do anything about the problem? "Illegals would not come to work here if employers did not employ them," Shockley said. I hate to say it, but they Illegal immigrants wouldn't be coming here if there weren't jobs to be had. Employers want employees to do the jobs they envision. With no employees, the jobs don't get done. So lets get the facts straight here, it's not the employers who are driving illegal immigration, its the jobs that are driving it. It is the shortage of workers that is causing an influx of illegal immigrants, according to Webb Brown of the Montana Chamber of Commerce. "There is still a huge work force shortage right now and it's only going to get worse," Brown said. "It is at crisis point right now and it is headed even in the worse direction." Both Shockley and Jopek think there are plenty of workers in Montana to fill jobs. Have Shockley and Jopeck looked at some of the unemployment statistics for the State of Montana? Here we see that Montana's unemployment rate continues to be below 3% which has all ready drove up wages throughout the state as employers compete for the scarce resource of employees. Another story indicates our states largest city has the third highest unemployment rate in the United States at 2.1%. This just shows the lack of workers in the state. I know I've had to up my wages paid to the hired hand significantly to get someone to fill the job on my place. The simple law of supply and demand at work. Now let's get down to the brass tacks here. I do not support illegal immigration or hiring illegal immigrants. Let me repeat that for all of you that are going to grouse at me about what I have said so far, I do not support illegal immigration or hiring illegal immigrants. Blaming businesses for hiring them is the wrong tack though. Illegal immigration is a federal issue and needs to be handled on the Federal level. Making Montana business owners responsible for the situation is simply stupid and wrong. Running a business is hard enough without worrying that every person you are hiring is an illegal immigrant with false documents that you might get thrown in jail for hiring. It makes no sense. What really gets me though is the simple lack of understanding shown by the Legislators about such simple business matters as employment and the unemployment rate. My own sister is right now in the process of looking for a job in the state of Montana. She admits that she can get a minimum wage job any time she wants but is looking for more than that. I just talked to her and she has quite a number of applications out for jobs that pay better than that. She told me she is very hopeful because with the lack of workers out there she will be able to get a good job very shortly because people need employees, the right job will be there. If Legislators would try to make the business climate of Montana less hostile to business, I know it's to much to ask them to be business friendly, they would never do that, we might have more businesses in the state to hire workers which would bring more people to Montana which would help drive the economy of the State forward. I sometimes think that they want to keep Montana held back. Why I am not real sure. All that is happening is the rich and famous keep buying up land, locking out Montanans from it, and not using it to drive the progress if our state forward. A mistake in my opinion but where the Legislators obviously want us to go. 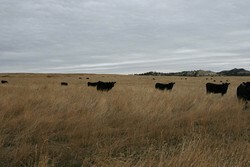 Calves scattered out over the grass getting fat and sassy. Taken 11/02/2005.